The idea that caught the judges’ attention was born in the nursing home that co-founder Jan Smolders runs in Belgium, and was developed into a smart system that allows housebound individuals to cycle the world. Jan realised that the inhabitants of his nursing home were looking at a wall while doing their exercises – hardly an inspiring activity – and it was this that motivated him to act. Teaming up with his brother Roel, then a health technology expert at the Flemish Institute of Technological Research, and IT-experts, Wannes and Jesse, from the University of Louvain, the team went on to develop the technology that offers older people who can no longer get out and about, a window on the world. 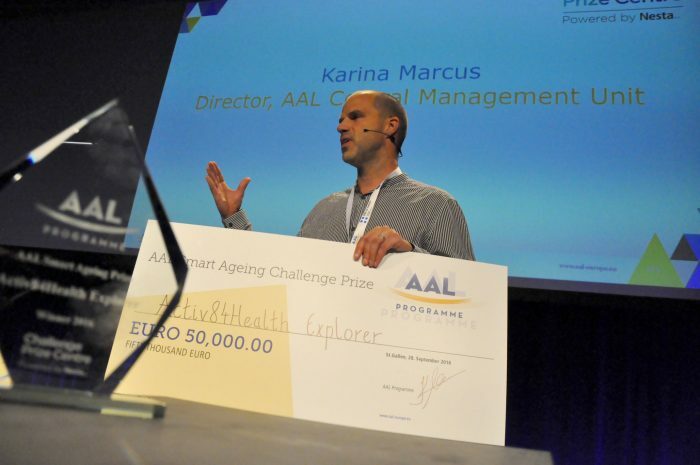 The first Smart Ageing Prize by the Active and Assisted Living (AAL) Programme, called for innovations in Internet of Things devices that empowered older adults to achieve the quality of life they aspire to, socially and independently. From 175 applications, 15 promising entries were selected as finalists who then received support and mentoring to produce detailed business plans. Five top finalists pitched their ideas at the AAL Forum in St. Gallen, Switzerland in September 2017. A year after the ceremony, we interviewed Activ84Health CEO Roel Smolders and asked him to describe the opportunities and challenges that the prize had presented. “First of all, the prize of €50,000 certainly was a big benefit for our company, as most start-ups struggle financially,” he said. “We do have over 40 paying customers already, but it never hurts to get more budget. However, the international spotlight that was offered to us when we won the prize was even more important. All of a sudden, we weren’t simply this ambitious start-up with a great idea, but we could affirm that, according to the AAL Programme, we had the most innovative technology for active and healthy ageing. This certainly opened doors. As for their future plans, Roel noted that: “Memoride is now at a point where it is ready for global implementation, so we are going to scale internationally. We currently have about 35 paying customers in Belgium and 5 in the Netherlands. These are typically nursing homes, hospitals and rehabilitation centers. “We now have business partners in The Netherlands, Sweden and Austria, and we are in ongoing discussions with companies in Luxembourg, Switzerland and some other businesses who are interested in distributing our technology in other countries. I’d really love to get in contact with businesses in Portugal, Spain, France or Italy. 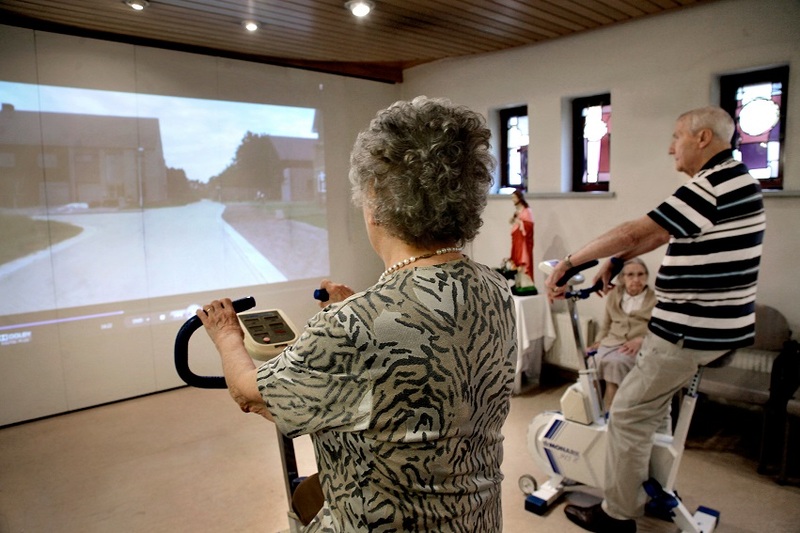 Using Google Streetview – connected to a stationary bike – cloud-based software, and touch screen controls, Memoride was designed to allow older people to explore familiar places from their past. As well as stimulating memories, this activity prompts social interaction in the home, while at the same time providing a valuable exercise routine. Each user has an individual profile, which allows the platform to take into account personal physical and cognitive abilities. Roel shared with us some unique emotional moments from the users’ experience: “During demonstrations, we often get very emotional responses, people in tears when they manage to visit places filled with memories. That is the unique aspect of Memoride, we can go virtually anywhere (as long as Google has pictures available), so people can really enjoy this unique and personalised experience. “Perhaps the most important aspect, which we initially overlooked, was the storytelling,” Roel continued. “Anyone that works with older people will tell you about the stories and memories that they have. Allowing them to go back to those specific locations gives them the fuel they need to share these stories. I believe this is the USP of our technology, and offers the greatest impact on their lives. The second AAL Challenge Prize will launch in November 2017.